Wyndham Garden Queenstown has officially opened its doors to guests (19 April, 2018). The 75-key property features complimentary Wi-Fi, a gym, meeting space, onsite car parking and a range of rooms and suites complete with kitchen facilities. With an emphasis on greenery, natural wooden tones and earthy colours, the hotel’s décor and landscaping create a relaxing environment synonymous with the brand. Wyndham Garden Queenstown is the hospitality giant’s second hotel in Queenstown, joining Ramada Hotel & Suites Queenstown Remarkables Park, which opened in 2016. Both Queenstown hotels are owned and operated by Marsden Asset Management and are among the company’s five Wyndham Hotel Group franchises in New Zealand, alongside properties in Auckland and Christchurch. 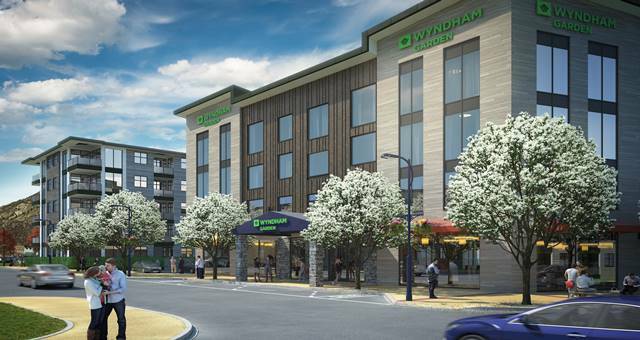 As the fifth completed collaboration between Wyndham Hotel Group and experienced local developer Safari Group, Wyndham Garden Queenstown follows four Ramada developments in Auckland, Albany, Christchurch and Queenstown. “We are proud to be able to bring the globally recognised Wyndham Garden brand to New Zealand as part of our second development in Remarkables Park and we anticipate that many tourists visiting Queenstown will enjoy a relaxing experience at the hotel,” said Robert Neil, Director of Safari Group. The new hotel is overseen by management couple Gary Hyde and Karen Barr, who each have more than 16 years’ experience in hospitality. Before leading the pre-opening team at Wyndham Garden Queenstown, the pair managed another Wyndham Hotel Group franchise property operated by Marsden Asset Management, Ramada Suites Christchurch City, for approximately two years. “The Wyndham Garden brand has an absolute commitment to getting the finer details correct, so we have gone to great lengths to find the right people from Queenstown and the wider Otago region to ensure we can best represent this inviting brand to the market,” Ms Barr said.